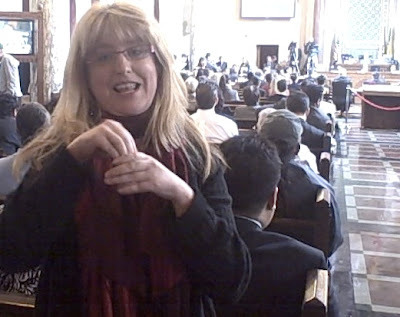 Catherine MacKinnon visited LA's City Council twice this week, both times working her way through the standing-room-only crowd to take a seat in the second row and to participate in the review of the CAO's budget recommendations. Once seated, she didn't look at the Councilmembers much and she didn't hear a single word they said. She can't. She's deaf. Catherine sat for hours, focused on the team of sign language interpreters who took turns translating the proceedings for the deaf members of the audience. The pace was so fast that the interpreters worked like a tag team and were still both mentally and physically exhausted. Like lots of other members of the public, Catherine was there to protect jobs, and in Catherine's case, it included the jobs of the people who were translating for her. Catherine was there to oppose the CAO's recommendation to "Eliminate the Department of Disability." She was also there to fight for the Cultural Affairs Department and when her turn came to stand before the City Council to argue her case, she stood silently but signing feverishly as an interpreter spoke on her behalf. She argued passionately as a deaf actor/producer, contending that the CAO's recommendations would have a negative impact on the many members of the artistic community who revitalize communities and contribute to the economy. She argued in favor of a commitment to access as a basic human right. She argued that a commitment to the arts is essential to a healthy community. By way of example, the NoHo Arts District has benefited dramatically from the contributions of the artistic community and is now a destination community featuring great transit, city-center development, and lots of great entertainment opportunities including the Deaf West Theatre. In a City that has abundant theaters, all competing for an audience, the Deaf West Theatre has quite a following. In fact it has a huge audience. American Sign Language is the third most common language in the United States, surpassed only by English and Spanish. It's estimated that the deaf and hard of hearing population in the Los Angeles area exceeds one million people. Catherine, like many others, depends on the Department of Disability in order to gain access the full Los Angeles experience which includes the many opportunities to share her gifts with the theatre community and the film industry. She also stands with the many artists who depend on the city's funding for the Department of Cultural Affairs. For 20 years, the City of LA has collected $1 in taxes per $100 of hotel room charges for the Department of Cultural Affairs, an amount that is the best part of their entire $9.6 million budget. This past week, City Council President and five other council members made a written motion to repeal the guaranteed arts funding. It took a Budget & Finance Committee meeting that went until after midnight on Monday followed by two long and focused City Council sessions on Tuesday and Wednesday to get to the moment of reckoning. CAO Miguel Santana argued that the City Council must act decisively to avert financial disaster while Councilman Jose Huizar countered that the CAO's proposal amounted to a $15 million plan to close a $200 million gap. When the dust had cleared, Catherine had cause to celebrate, twice. The City Council gave the Department of Disability a reprieve and then voted unanimously to maintain the guaranteed arts funding for the Department of Cultural Affairs. As the City Council regroups and puts their focus on increasing revenue and as the Department managers work on efficiency and reducing costs, it is imperative that the people of Los Angeles consider the core priorities of a Great City and communicate clearly to the Mayor and the City Council on the city services that are essential. LA's character demands that we embrace and support the rich diversity and abundant creativity that makes us a destination for everybody from tourists to those who seek the land of opportunity and promise. It's now, more than ever, that we need to work together to solve our budget problems and the process must not start with the exclusion of any group of people. Everybody must have access to the process and that is a commitment that LA must not break. If Los Angeles is to take its place as a Great City, it will be … at the very least in part … because of the work of the Department of Disability and because of the work of the Cultural Affairs Department.